I am now accepting testimonials. This will help the community learn about the important clinical results achieved at my clinic. I look forward to adding testimonials to the website throughout the year. I have been seeing Adam White for a year for treatment of osteoarthritis of my hands. My right hand had already become quite disfigured and I had alot of swelling and pain in the ring finger of my left hand. The only treatment prior to seeing Adam was cortisone injections in the fingers which I could not have more than every 6 months. Sometimes the shots helped and sometimes not. With Adam's treatments, I no longer have injections, the swelling is very minimal and my pain and mobility are greatly improved. I can now garden and do many other activities that were becoming impossible before. I get one treatment a month and am able to maintain my lifestyle. I am very pleased at the progress. My only regret is that I wish I had started seeing Adam sooner. Thanks Adam for helping me get back to my life. I have been tolerating migraines, shoulder and neck stiffness for approximately 4 years now. Within the last month, Adam has changed things around completely for me. For the first time in 4 years, I am not waking up with headaches anymore. And, for the first time in 4 years, my shoulders and neck are rapidly becoming less stiff. My shoulders are actually relaxing now. Words cannot adequately convey the sense of relief I feel. I really cannot remember the last time my shoulders felt normal. They have been as stiff as rocks, and they now are finally loosening up. It's amazing to be waking up without those horrible headaches as well. Thank you so much. Adam, I want to let you and all people know that you have helped me tremendously. I could hardly walk, because of spine and back problems. I was looking at a third back surgery to control the pain I was getting in my lower back and leg. Your treatments, Adam, have reduced the pain to a minimum. The first treatment, I could hardly get onto the treatment table. Afterward, I got off with little difficulty. It has been getting better since then. Through the years, Adam, you have helped me with many problems. Thank you! Adam has helped me through the years with some very challenging problems: RLS (restless leg syndrome) with PLMD (periodic leg movement disorder); and more recently, CRPS (complex regional pain syndrome). All of these neurologically-based problems are life-altering, yet most doctors can do little more than offer strong drugs for them. Getting the RLS into complete remission took years, but the progress was measurable and drug-free. Adam was able to knock down the CRPS within a few weeks, and with some sympathetic nerve blocks, I feel like a normal person! Adam has also helped with post-surgery healing when needed. He works with you (and your doctors, when needed) to help improve your health and well-being. He is a true healer. I've had terrible pain in both knees for about 1 1/2 years. I went to physical therapy with little change. After the first 3 treatments with Adam White, my knees were 80% better. Presently, I am almost pain free. The relief from this discomfort is unbelievable. Try 9 days of pounding pain in the right hip, accompanied with raging hot inflammation around the artificial joint, as I did. Upon meeting with Adam White and receiving the treatment, within 50 minutes the pain and inflammation left the area. I was able to walk well and think straight again. Over the 50 minutes I felt the pain slowly subside with the minutes passing by. This man knows his profession. He said it wasn’t a miracle, but for those in horrible pain, it feels like one. I need a few follow-up treatments to keep the improvement. Maybe an occasional tune up as needed after that. It is so worth the treatment. Adam is the man in my book! I wanted to thank you for the treatments you gave me. I came in to your office last July/August because I had been having horrible headaches and a stiff neck for 4 months which my doctor had diagnosed as nerve pain (neuropathy). He put me on prednisone which didn't work and then he sent me to an ENT specialist who prescribed muscle relaxers and anti-inflammatory medications. They didn't help at all. Everyday I was going to work and getting more and more depressed because of this pain. It was affecting my everyday living. The pain radiated on the left/top side of my head and was also affecting the outside of my left ear. It was as if a drill was going in my ear and coming out the top of my head. My manager told me I should go see you to see if you could help me. You seemed to know right away what the problem was (concha) and after 4 visits I felt almost brand new. It was about a week after my last visit that the pain completely subsided. I really think that if I had'nt gone to see you I would still be having this problem. I'm not sure how it happened or if it will come back, but if the pain returns I won't waste my time in going to my primary. I will pick up the phone and make an appt. with you. Thank you so much in making me feel like a normal person again. I want to thank you so very much for the help you have given me! Before coming to you for acupuncture, I was unable to stoop. I recall being in a store, dropping something and trying to pick it up. It was very embarrassing to stoop down, get the item in my hand and having to grab whatever was in reach with one hand, hope it would support my weight, then use my other hand to press on one knee and with all my might and strength, push to get back to my feet. I felt old and awkward which was worse than the pain. It is so very different now. I can stoop down, pick something up without pain and without giving it a second thought. My entire body is changing! I am on a journey going back in time to a younger feeling me! It isn't the age number that makes a person old, it is the way they feel! I developed wet macular degeneration in one eye (following surgery to repair a detached retina). My surgeon treated me with laser treatment followed by an eye injection. Weeks later there was no improvement at all so he gave me another injection of the same drug. I immediately went to Dr. Adam White for the first time. He treated me with acupuncture. The next visit to my surgeon showed improvement. I am continued seeing both doctors and was surprised one day when my surgeon told me I tested better on the eye chart with BOTH eyes! The surgeon is only treating ONE eye. Dr. Adam White is the only doctor who truly treats my entire body with the intention of CURE. My eye specialist was shocked and amazed when she examined my eyes. She wanted my acupuncturist name and info so she can have him treat HER eyes! She told me my sight in my good eye is better, even with a beginning cataract condition, than it was years ago when she first prescribed glasses for me! She also said, my bad eye, macular degeneration, has gotten extremely better when that should never have happened! I am using herbs from him that has allowed me to stop taking Nexium. Nexium was easier and worked for the symptoms of acid reflex, but the herbs are healing the flap that quit working. Now the gasses stay where they belong. At some point I will no longer need the herbs. Thanks so much for all you have done for me! I will be forever grateful! Dr. White’s treatments have literally changed my life. As a result of taking several rounds of antibiotics for a staph infection, I suffered from hepatitis of the liver and experienced several episodes of jaundice. Dr. White’s treatments helped my liver improve its overall functionality. His treatments also helped my skin recover from incredible wounds and scars from the systemic infection. I’m now able to wear shorts and skirts after many years of having to keep my legs covered. I continue to get treatment to remove further toxins still lingering in my body, but I consider myself a healthy individual – something I haven’t felt in a long time. I am forever in gratitude of Dr. White’s efforts and the very caring staff that his office employs. Thank you so much!! After 3 moxibustion treatments for a breech baby I'm happy to share with everyone that today I was told by my physician that my baby was no longer breech. I highly recommend Adam White to anybody who is looking for an alternative to external cephalic version. Moxibustion is not painful and it will not hurt a baby in any way. Again, thank you Adam. Adam White is very knowledgeable and professional. He has successfully treated me for Sinusitis, Back Pain, and Insomnia due to my shift work as a Firefighter. I unequivocally recommend Adam for all your healthcare needs. His front staff is also very efficient and organized. This place is truely amazing. I ended up here after years of pain when doctors told me I had no options left. Adam White is knowledgeable and won't make promises he can't keep. Has always been honest with me and has helped me immensely. I have been to a lot of bad acupuncturists before and since him, nothing compares. 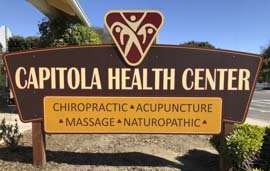 I have been to many acupuncture clinics in Santa Cruz and I have continued with Adam. I have been to Adam for many treatments, from pain to seasonal colds and I have benefited from both his acupuncture and chinese herbs. It truly feels like a fully holistic approach to wellness. He is also very personable and practical in his approach. His front desk staff are awesome and have helped guide me through the insurance hoops with patience and tenderness. Yes!!! Adam White's competence is highly respected in the medical community, and his reputation is impeccable. His "beside manner" is fantastic. He exudes compassion and warmth, while diagnosing, treating, and answering questions with clarity and professionalism. Working with Adam is a unique opportunity to experience the best that Chinese medicine has to offer. If you have questions about whether acupuncture is appropriate for you, he is able to answer everything to your satisfaction. He has learned from the best, and he IS one of the best. I'm a doctor and I've been working with Adam for many years. He is highly professional and knowledgeable and has helped numerous patients whom I've referred to him. I highly recommend Adam if you are seeking high quality acupuncture care. I have heard nothing but great feedback from people that have been treated by Adam White, the acupuncturist and herbalist, for a variety of issues. After trying every prescription drug, over the counter remedy and seeing other doctors, Adam white is the only one that was able to treat and cure my severe motion sickness. The herbs he provides me now give me the comfort to go on long drives without any problems! He is as knowledgeable and kind as I had been told. I now hope others will seek him out for relief from their issues, as I could have saved tons of money and time going to Adam White first. Has helped where others and medications have failed. To have this level of true relief and recovery is great. Thanks. Good results! Quality acupuncture with results! I am very happy with the acupuncturist and his work. He takes his work seriously and helped me a lot. I am grateful for all he has done. I suffer from allergies year round and wanted to stop using prescription nose sprays, eye drops, decongestants and antihistamines everyday and wasn't thrilled with the idea of a 5 year commitment to a shot clinic. On the recommendation of 3 friends with different issues I visited Adam White, within a couple of visits the most severe of my symptoms had started to improve. His office clean and comfortable and his staff is friendly and courteous. I am a now a big fan of Adam White! Dr. White is the whole package. Extremely experienced and knowledgeable in his field of Chinese medicine, genuinely compassionate, and has a flexible and accommodating schedule for everyone's needs. His staff is friendly and helpful and the clinic's atmosphere is warm and comforting . After years of struggling with allergies, countless Western medicines and allergy shots later, I've finally found relief in a safe and healing way. I would recommend Dr. White to anyone for whatever ailments they have. Wow, can't thank you enough for the acupuncture treatment! It was awesome! Thank you. As my primary care provider for more than 18 years, Adam White has treated me through some serious conditions including Post Partum Depression and healing a back injury. For the past 10 years, I have come in for a couple of tune up appointments in the interchange between Summer and Fall. With Adam's knowledge and skill, I am 51 years old, in good health, and prescription free. Thank you Adam!